Group campers are campers who come to Oakridge Camp as part of a church, social club, or other organization. We design our program so that group leaders can focus on building relationships with their campers, not planning the next lesson or meal. There will be a 45-minute session each day for leaders to catch up with campers as a group, talk about questions they have or lessons leaders want to hit home, and enjoy time together. All other activities and events are planned by our camp staff! For safety of all guests, we require a 1:9 minimum leader to camper ratio for each gender (if you do not meet this requirement, we can provide excellent staff to supplement for an extra fee). 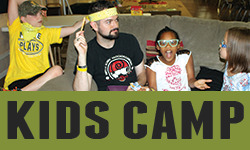 Click the buttons below to take you to Kids, Teen, or Mixed Camp.